Return to Index Mount Vifilfell, June 8, 2007. Super Puma TF-GNA excercising mountain rescue in the slopes near Mount Vifilfell. 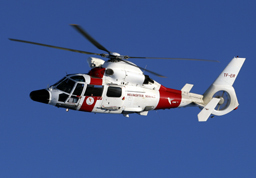 TF-GNA is the latest addition to the IGC helicopter fleet. Note the rotor tip condensation in the humid air of the evening. Return to Index Mount Vifilfell, June 8, 2007. 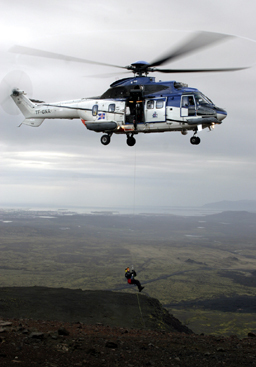 Super Puma TF-GNA excercising mountain rescue in the slopes near Mount Vifilfell. 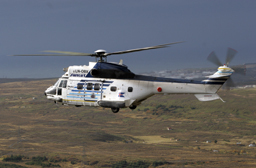 TF-GNA is the latest addition to the IGC helicopter fleet. Arrived in Iceland on Saturday June 2, 2007. Note the rotor tip condensation in the humid air of the evening. Return to Index Mount Vifilfell, June 7, 2007. Super Puma TF-GNA excercising fast approaches in the slopes near Mount Vifilfell. 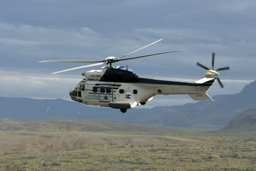 TF-GNA is the latest addition to the IGC helicopter fleet. 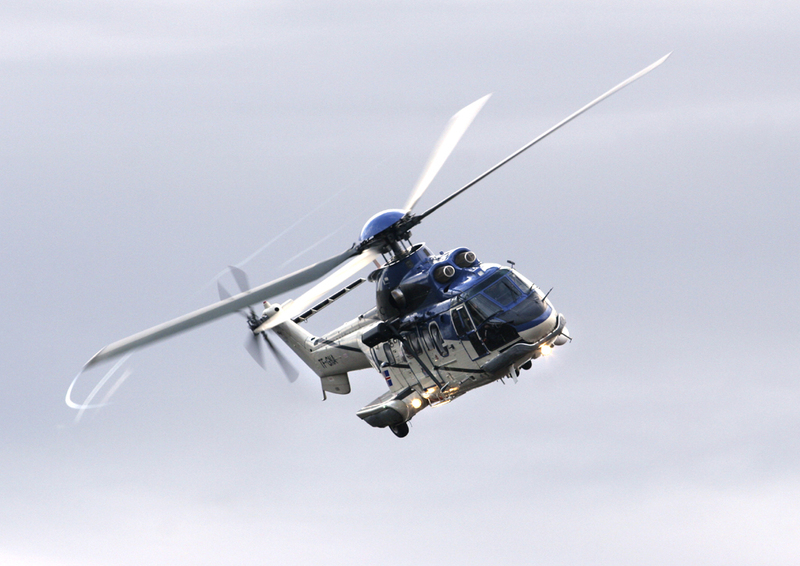 Note the rotor tip condensation in the humid air of the evening. Return to Index Mount Vifilfell, June 7, 2007. 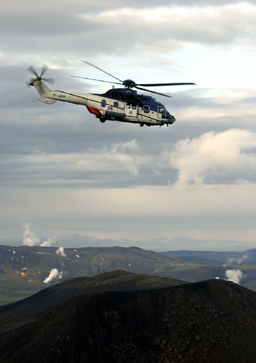 Super Puma TF-GNA passing by the top of Mount Vifilfell. In the background you see the steam from the latest thermal power plants near Mount Hengill. 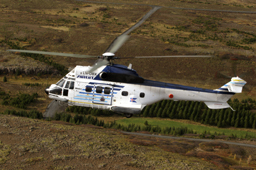 TF-GNA is the latest addition to the IGC helicopter fleet. Return to Index Langahlíð, a mountain in the vicinity of Reykjavík, February 7, 2007. Doing some exercising on the new Dauphine, TF-EIR. The pilots dropped the photographer off on the top of the mountain in freezing but sunny weather and then did some circling. Return to Index Reykjavík, October 11, 2006. The newly arrived leased Super Puma, LN-OBX arrived in Reykjavík on Saturday, October 7. 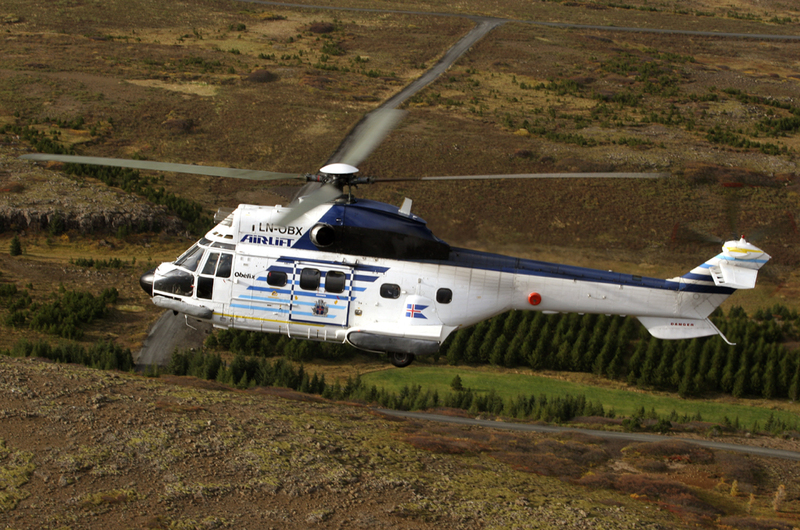 This series was taken of it during the first flight with two Icelandic pilots. The photo ship was Dauphine, TF-SIF. Here is the takeoff from in front of the Coast Guard Hangar 2. Return to Index Reykjavík, October 11, 2006. The newly arrived leased Super Puma, LN-OBX. Over the lava fields to the east of Reykjavík. Return to Index Reykjavík, October 11, 2006. The newly arrived leased Super Puma, LN-OBX. Over the lava fields to the south of Reykjavík. Return to Index Reykjavík, October 11, 2006. 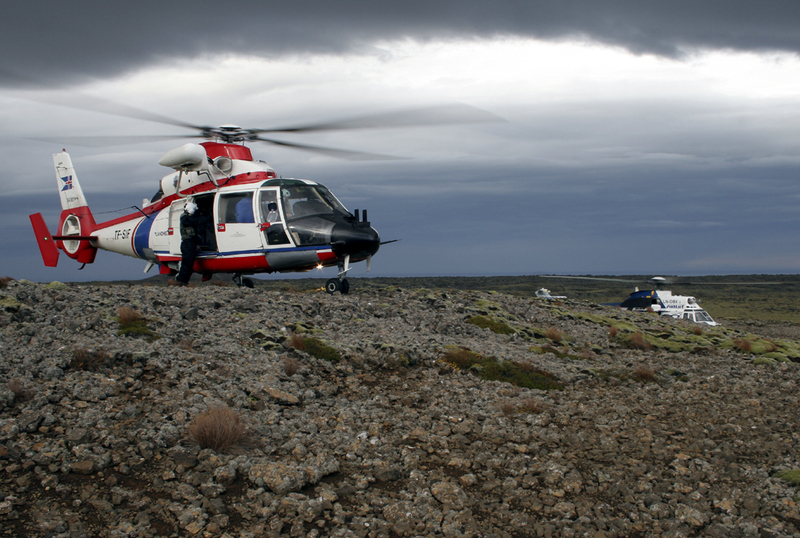 The newly arrived leased Super Puma, LN-OBX and Dauphine TF-SIF exchanging passangers in the lava fields to the south of Reykjavík. Return to Index Reykjavík, October 11, 2006. 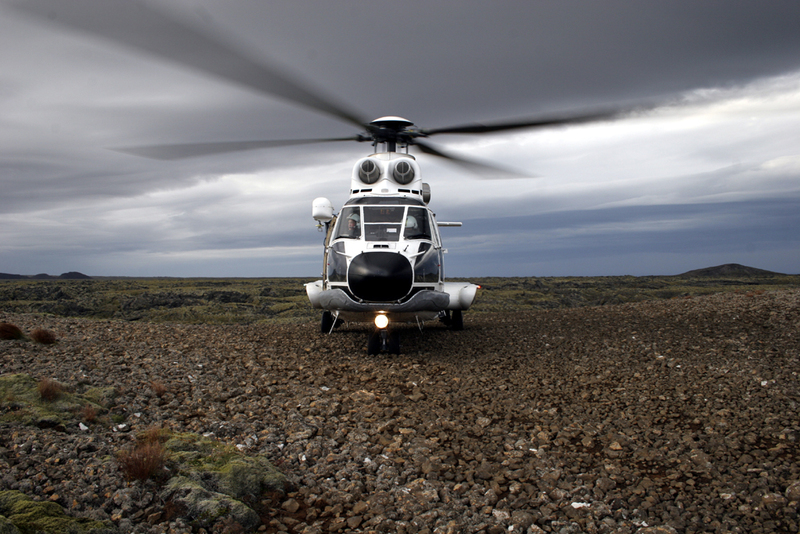 The newly arrived leased Super Puma, LN-OBX waiting to take off from the lava fields to the south of Reykjavík. 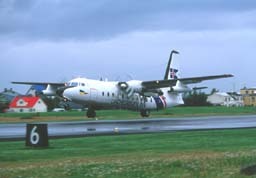 Taking off is Fokker F-27, TF-SYN of the Icelandic Coast Guard. The weather was rather indifferent during the day, and the light was definately not good, most of the photos being taken against the light to the south and the rain also came from the south. The pilot is showing a quick reaction retraction of the landing gear, which usually has not started to retract this soon after take-off. Passing by is Fokker F-27, TF-SYN of the Icelandic Coast Guard. The weather was rather indifferent during the day, and the light was definately not good, most of the photos being taken against the light to the south and the rain also came from the south. Aerospatiale Dauphin, TF-SIF, performing a tight turn to show its quick reaction landing performance. Return to Index This photograph is taken from a mountaintop south of Reykjavík on September 30, 1998. 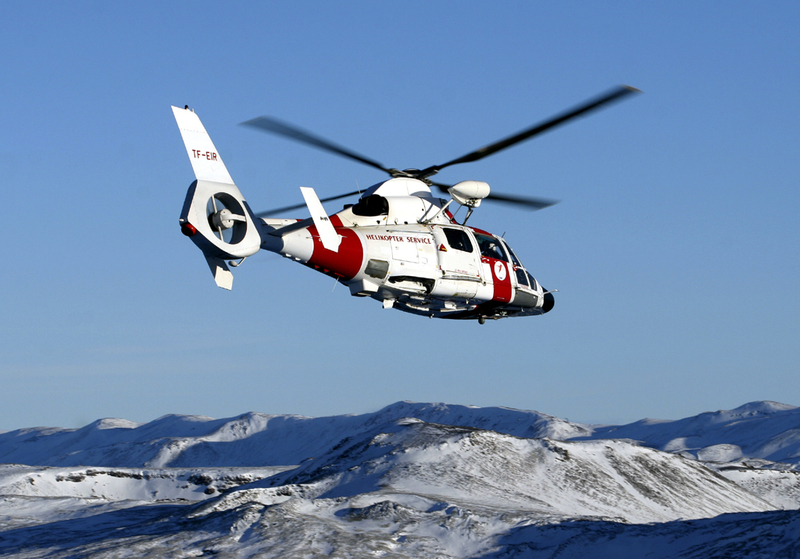 The Coast Guard pilots are performing a routine rough terrain rescue practice and this photographer had the good fortune to be dropped on the mountain top first. Here a shallow approach is practised. Return to Index September 30, 1998. 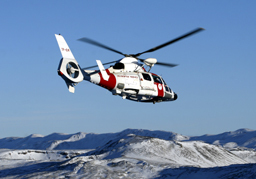 Holding position near a hilltop is important while the stretchers are lowered to the rescue scene. Return to Index September 30, 1998. 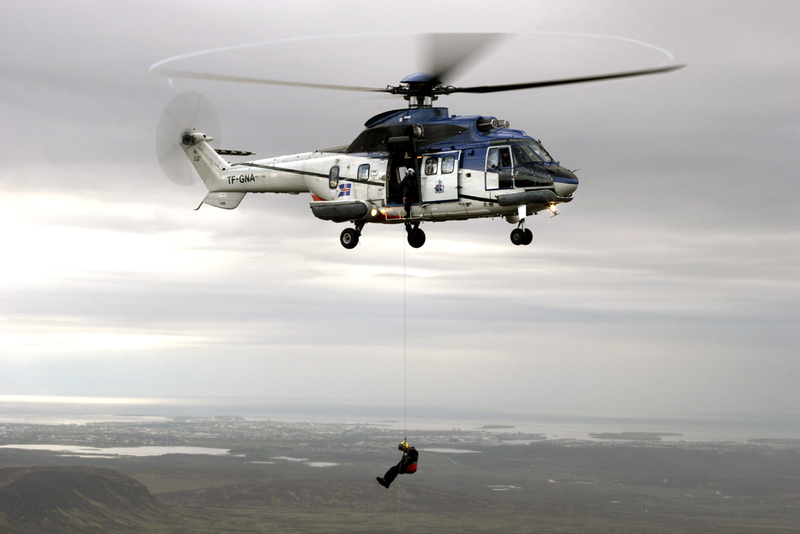 The Super Puma winch operator lowers the winchman down on to the Sveifluháls mountain range. Return to Index September 30, 1998. The winchman is hoisted back into the helicopter. Mission accomplished! Return to Index September 30, 1998. Leaving the site after a successful rescue. Return to Index September 30, 1998. Bon voyage. 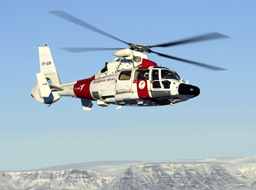 Return to Index These three photographs were all taken on 8 July, 1998 when the Coast Guard Aerospatiale Dauphin, TF-SIF was practising rescue from a mountain top near Reykjavík. The mountain that is backdrop to this and the next photo is named "Helgafell" which translates roughly to "Holy mountain". Return to Index TF-SIF is turning towards the mountain top with the "Holy mountain" in the background on 8. July, 1998..
Return to Index Taken on 8. 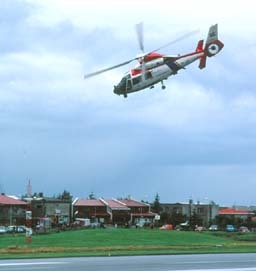 July, 1998 from a mountain top, the Coast Guard Aerospatiale Dauphin TF-SIF is practising for a mountain rescue. 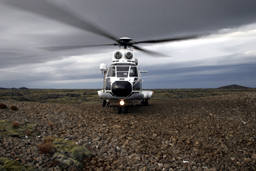 Back to Index The Icelandic Coast Guard Super Puma, TF-LIF on exercise flying by the side of the mountain Esja, close to Reykjavík. Photographed from ICG Daupine, TF-SIF on March 6. 1998. Back to Index The Icelandic Coast Guard Super Puma, TF-LIF on exercise with one of the rescue boats of the National Lifesaving Organisation over the approaches to Reykjavík harbour. Photographed from ICG Daupine, TF-SIF on March 6. 1998. 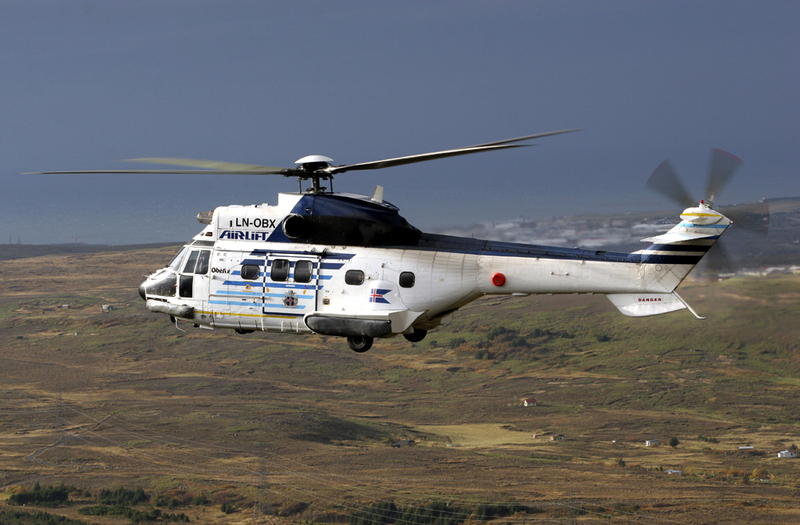 Back to Index The Icelandic Coast Guard Super Puma, TF-LIF on exercise over coast near Reykjavík, photographed from ICG Daupine, TF-SIF on March 6. 1998. 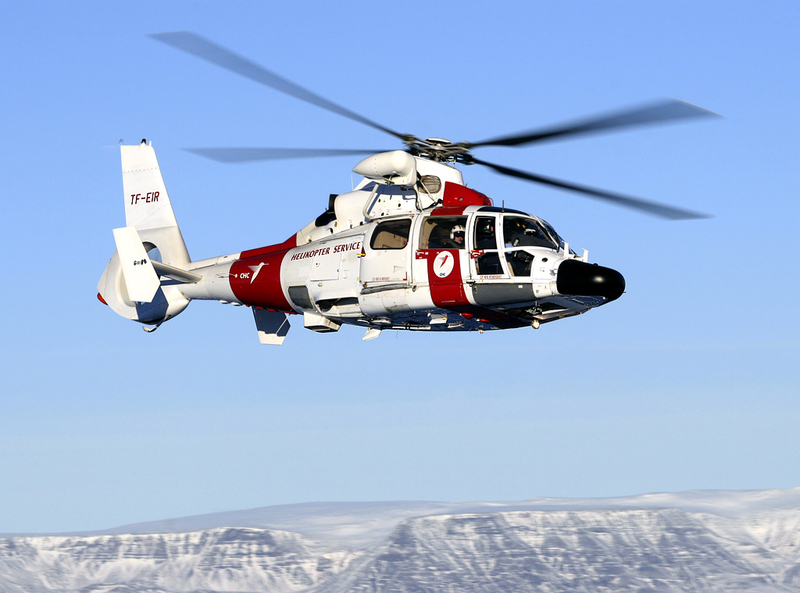 Back to Index The Icelandic Coast Guard Super Puma, TF-LIF on exercise over the choppy sea, photographed from ICG, Daupine, TF-SIF on March 6. 1998. 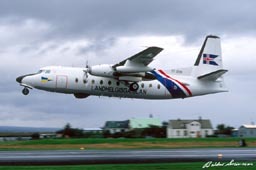 Return to Index Fokker F-27 TF-SYN from Landhelgisgæslan (Icelandic Coast Guard) taking off from runway 02 at Reykjavík Airport, heavily laden with fuel for a long patrol on April 6, 1998. Back to Index Fokker F-27 TF-SYN of the Coast Guard during an airshow low pass. 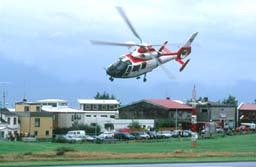 Back to Index Aerospatiale Dauphin TF-SIF landing at Reykjavik Airport. 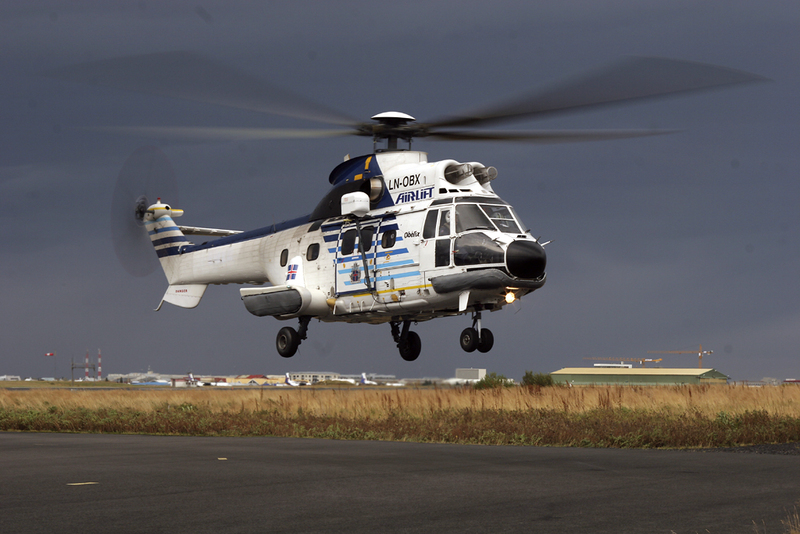 Back to Index Super Puma TF-LIF of the Icelandic Coast Guard landing at Reykjavík Airport for the first time. Back to Index I once decided that the only photos I would have on this website were of aircraft in action. This photo however is very special showing the Coast Guard fleet when it was largest, on October 13, 1980.